Note the presence of lovely trees setting off the model Starbucks store. What a shame we don’t have any trees like that in front of our new Starbucks. Written August 31, 2009 at 9:43 p.m. The difference between the real trees and the ones in the sign is Starbucks reality gap. They cut down the trees, erect a sign of a tree, and inside you can buy a CD and a percentage will go to save the rainforest. Imagine the good they are doing there, in the rainforest. Saving trees that don’t block their sign. 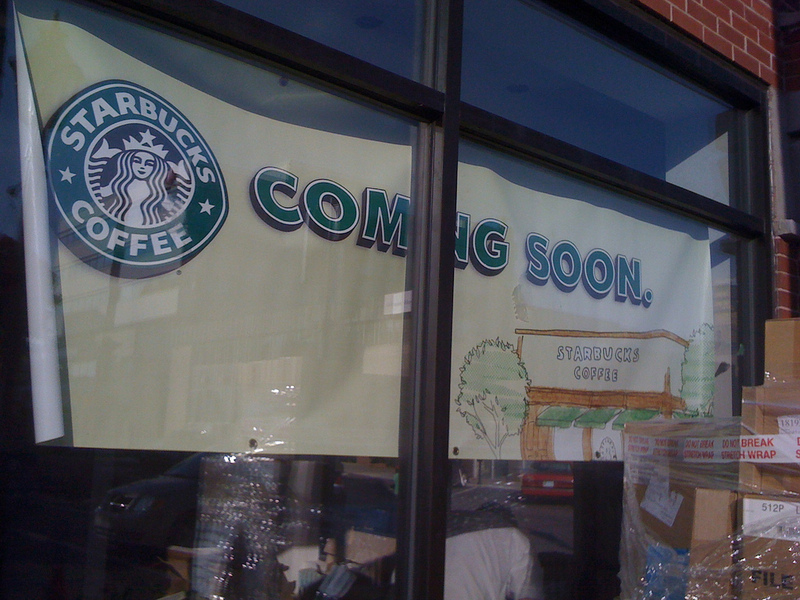 Once Starbucks puts down roots in Charlottetown with their new branch, their investment will bear fruit or nuts or leaves or twirly helicopter thingys. Is it just me or does the power pole outside Starbucks stand out line a sore thumb? The tree on the corner once helped cover up the pole but now it’s just…there. Maybe they’ll plant one, since they’re so about image. They must have the pull and the money do it, even it is city property. Maybe they’d even be willing to make it a native.